The calumet, known by white men as a “Peace Pipe” was a most sacred object for American Indians from the Great Lakes area to the Rocky Mountains. The pipe bowl was laboriously made from reddish, soft stone from a Pipestone Quarry in present day southwest Minnesota. One of the earliest white men to see and describe the quarry was the artist George Catlin, while on his epic journey to chronicle the American Indians and their lifestyles in the early 1830’s. The stone has forever after been known as “catlinite”. The separate stem was three or more feet in length and decorated with meaningful otter skin, feathers, hair and quillwork or beads. Often times it was painted red, especially if war was eminent. Smoking of the pipe occurred prior to very important or solemn events to bring good fortune or to influence circumstances pertaining to both peace and war. Some were powerful “Medicine Pipes” and kept in sacred bundles and used only for elaborate ceremonies which were performed by the guardian of the pipe. 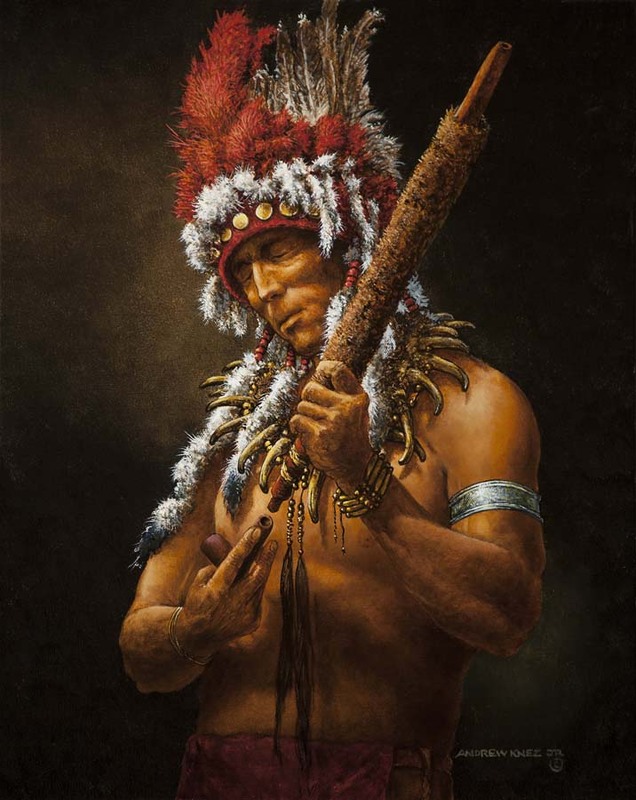 The guardian of the pipe in this painting is wearing a distinctive early style traditional headdress, worn by important men in the Blackfoot nation. It is made up of vertical eagle feathers which are attached to a red trade wool covered leather base and trimmed with white ermine skins and flat brass “coin” buttons. His grizzly bear claw necklace was highly desirable because of adoration of the great beasts’ strength and courage, and it was thought that those attributes would be transferred to the wearer.